Lost toys, now a reality! 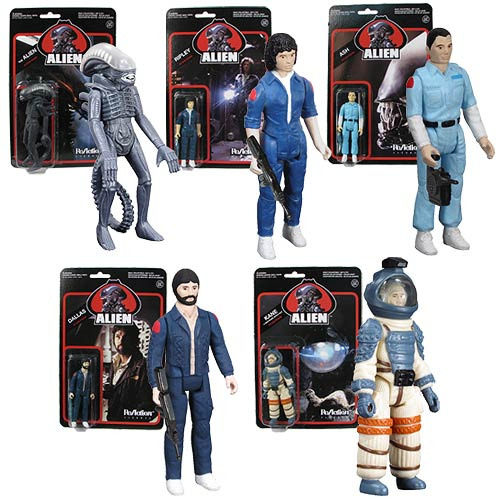 3 3/4-inch ReAction Figures of key Alien characters. Based on 1979 prototypes manufactured by Kenner! Great collector's pieces for fans of the retro Kenner-style action figure! The long lost Alien Kenner action figures that never went into production can finally be added to your Kenner and action figure collection with these Alien ReAction Figures from Super 7! Each 3 3/4-inch figure comes with approximately 5 points of articulation, accessories, and period-authentic blister-card packaging. They're great collector's pieces for fans of the retro Kenner-style action figure. In 1979, prototypes for 3 3/4-inch action figures for the Alien film were developed but never manufactured by Kenner. Based on unearthed reference material and original 34-year-old prototypes, these "lost toys" are now a reality! Ages 17 and up.